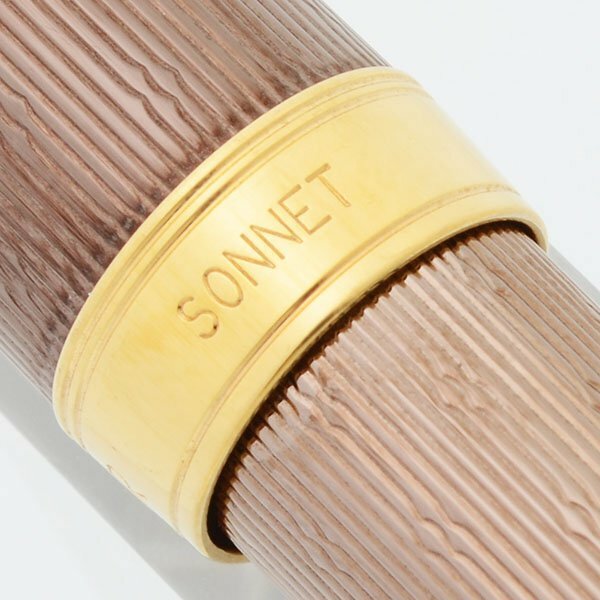 Parker Sonnet rollerball pen made in 2008. 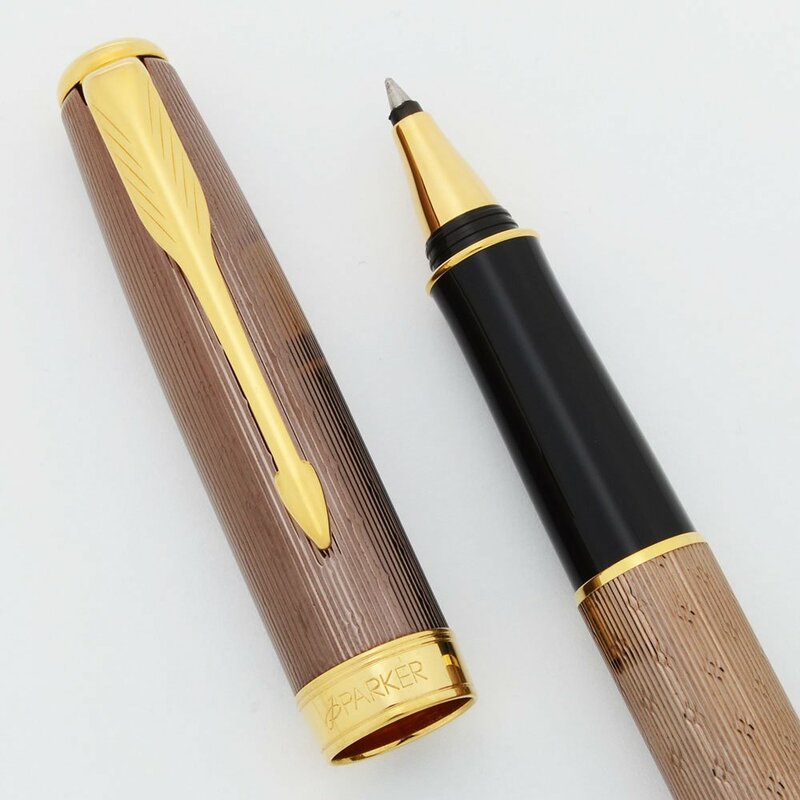 Chiseled Chocolate Laque pen with gold plated trim and a 1/4" wide cap band. Excellent + condition, working well. 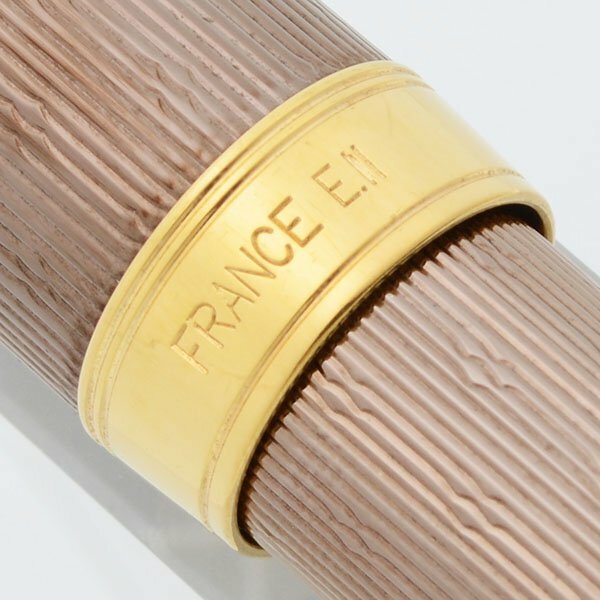 Manufacturer and Year Parker, France -- this one was made in 2008 (the imprint is a clear E.II). Filling System It takes Parker style rollerball refills, and it will come with a working one. Color "Chiselled Chocolate" pattern -- Metallic lines and diamonds pattern with a light brown coloring. The photographed color is accurate but looks dark because the reflective properties don't photograph well. It's feels bright in hand. Gold plated trim and a 1/4" cap band. There's a black plastic cap jewel. Condition Excellent + condition for this shimmery, classy pen. The coloration is rich and lovely and gives off a copper glow. The section looks great. The gold cone above the section has a little area of scratch marks toward the top. The cap band and clip have some light scratching but they look lovely. No visible scratches. No cracks, chips, dents, or dings. The imprints (including date code) on the cap ring are crystal clear.